With a stomp of the dancer’s feet and a strum of the guitar, the flamenco dance begins in tantalizing suspense and unfolds into an irresistible performance. Inspired by the gypsy culture of Andalusia, flamenco dancing evokes a passion and energy so unique that it continues to stand out as one of the most exciting art forms to witness today. The Spanish dance is nowadays recognized as a symbol of the nation’s identity and is performed and enjoyed throughout the world. Flamenco dancing originated in the 15th century, with the arrival of the Gypsies to Spain and Portugal. The gypsies traveled for centuries across different lands and collected a variety of folk dances from the cultures they experienced. When they arrived in Spain, the flamenco dance became a way to express themselves creatively. The first Cafe Cantante opened in Seville in 1842, and served as the birthplace of flamenco as a performing art. They were night bars where locals and travelers would stop in to enjoy the performances put on by the dancers and their vibrant bands. By the 1860’s, similar cafes were established throughout Andalucia, Madrid, and in other areas of Spain. Essentially, the flamenco guitar is built with the same methods used to build a modern classical guitar. Although the two are similar in body and sound, the flamenco guitar has a particularly distinctive sound and playing action of its own. Players used different posture, strumming patterns, and techniques for flamenco play. The musician tends to play the strings as close as possible to the bridge, in order to produce a harsher sound quality. When the flamenco dancer claps to signify the beginning of the dance, the musician answers in a musically authoritative response. 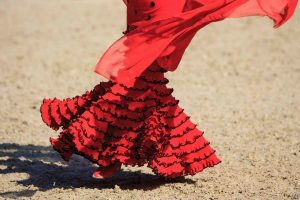 The flamenco dancer’s outfit, or traje de flamenca, is something to be admired. Both versions of the traditional garb are layered in ruffles on the skirt and sleeves. The dress is either brightly colored or decorated by a bold pattern such a polka dots. The dancer typically wears her hair in a bun or comb, pulled back from her face so that she can dance fiercely and with precision. Experience Flamenco Dancing in Spain With AESU! AESU offers several trips to Spain, including: Euro Explorer and Continental. Explore Spain and its spectacular landscapes. Try a variety of authentic Spanish tapas and delicacies from all over the country! If you have any questions or want help booking your Spain adventure, please contact AESU by calling 800-638-7640, or fill out the contact form found on our website! This entry was posted on Wednesday, January 11th, 2017	at 11:49 am	. You can follow any responses to this entry through the RSS 2.0	feed. Both comments and pings are currently closed.